Effects on the boundary between two plasma areas. Acceleration of electrons by electric field of the storm clouds. E-learning support and popularization of physics and astronomy. Sample image showing numerical solution of the dispersion relation in situation of one plasma beam penetrating into the plasma background. Imaginary parts are depicted in red color and are responsible for instability growth. 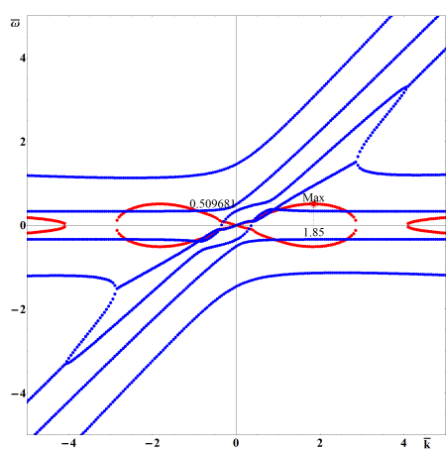 Effects on the boundary between two plasma areas: Dispersion relation of the interaction of two plasma beams was solved in many partial situations. However it wasn't solved generally with magnetic field heat transfer effects and for general frequencies. Plasma beam interaction with the plasma background is simply scalable and results can be used for any problems, i.e. both for interaction during fusion experiments and for astrophysical problems. Acceleration of electrons by electric field of the storm clouds: In the area of lightning discharges, there are many experiments - from monitoring gamma-ray bursts from storm areas, measurement of X-rays and charged particles flows to taking photos of discharges from the storm cloud upward into the ionosphere. The mechanism of observed phenomena isn't known well. The interaction of particles and R waves is an important task for the solution of the magnetospheric problems, where there is measured large amount of not yet fully elaborated data from satellites and ground stations. Left figure: GUI of the PIC program developed in our group. Right figure: One of the outputs of the PIC program shows turbulent structures in the plasma beam. 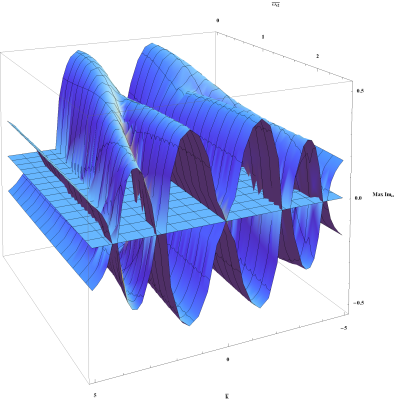 Mapping of the field was made by the method LIC (Line Integral Convolution). Reconnections of magnetic lines are marked with the arrows. Analysis of the two stream instability dispersion relation in general magnetic field. Analysis of frequency spectra of the electrons accelerated by field of storm clouds. PIC (Particle In Cell) simulations of plasma instabilities. Relativistic form of the Fokker-Planck equation and Chandrasekhar function. Left figure: Decomposition of the aurora image to three colours channels. This is the most noticeable graininess in red (left), less then in blue (right). In the green channel (center) with scarcely any grain. 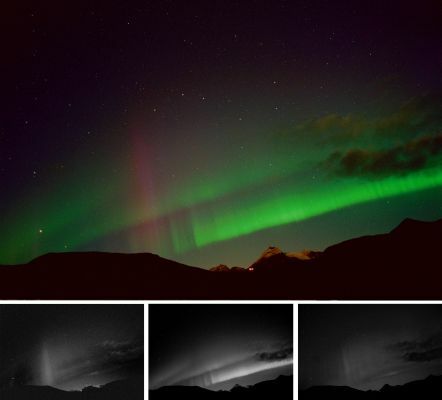 The photo was taken during expedition Aurora on 18th Sep 2002 at 0:52 CET in the mountains Skjormdalen on the diaposivite material Kodak EPL 5075, sensitivity 400 ISO. Exposure 20 s, aperture 2.2. Right figure: Dependence of the imaginary part of dispersion relation on the cyclotron frequency.